Mulatu Astatke & His Ethiopian Quintet - Afro Latin Soul Vol. 1. Vinyl LP. Bleep. The Mulatu Astatke resurgence continues to pick up speed with the first reissues of his 1966 excursions into Afro-Latin jazz. After studying at Boston’s Berklee College of Music, Astatke was living in New York at the same time as other future greats of African music Miriam Makeba and Fela Kuti. During this period he formed The Ethiopian Quintet, a group that consisted of jazz musicians from the Ethiopian, Latin and American styles. 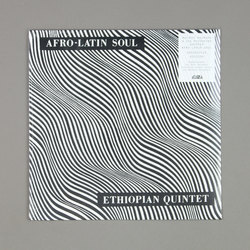 The resulting blend of sounds is both unusual and groovy, synthesising the shuffling rhythms of mambo, rumba and r&b with Astatke’s Ethiopian modes. Now remastered for Strut and replete with new liner notes by Astatke himself, Afro Latin Soul, Volume 1 is a crucial early piece of the great man’s output.